Most Hispanics are confident their finances will improve in the next year and also see a bright financial future for their children. Those already prospering are the most likely to be optimistic in their expectations about the next year. Looking ahead, optimism about their family’s future economic prospects has risen faster among Latinos than in the population as a whole. The share of Latinos who expect their family finances to improve “a lot” or “some” in the coming year is up 14 percentage points, from 67% in 2008 – during the Great Recession – and in 2011 to 81% in 2015. By contrast, the share of all Americans who share this optimistic view of their family’s pocketbook prospects rose 6 percentage points to 61% during that time. This analysis shows that all of the increase among Hispanics in perceptions about their family’s finances has occurred since 2011 when, two years after the Great Recession officially ended, 67% of Latinos said they expected their finances to improve “a lot” or “some.” That share then grew by 6 percentage points to 73% in 2012, and now stands at 81%. Among the general public, the share of all Americans with a similarly favorable view of their family’s future finances rose by 3 percentage points from 2011 to 2015. Since 2004, the Pew Research Center’s National Survey of Latinos has found that Latinos are consistently more optimistic about their next year’s finances than the general public. But the current 20 percentage point gap in financial expectations (81% for Latinos vs. 61% for the public) is the largest since the series began. Latinos are broadly optimistic about their economic prospects. Fully eight-in-ten Latinos (81%) say they expect their family’s financial situation will improve in the coming year, a 14 percentage point increase since 2008. The 2015 reading includes 23% of Latinos who predict they will fare “a lot” better – the largest share of Hispanics to express this upbeat view since 2004 and an increase of 12 percentage points since December 2011. 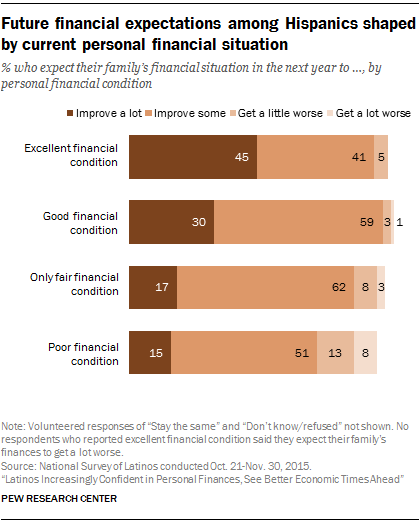 An additional 58% of Latinos expect “some” improvement in their family’s financial health. Only one-in-ten say their finances will get “a lot” worse (3%) or “a little” worse (7%) in the year ahead, down from 16% in 2008 and a 12 percentage point decline from 2011, when 21% expressed a similarly pessimistic view. Nearly all major demographic groups recorded some increase in economic optimism, but some groups gained more than others. As with perceptions of their current financial condition, older Latinos were significantly less upbeat about their short-term economic future than were younger and middle-aged Hispanics. About six-in-ten Latinos 65 years old or older (59%) say they expect their family’s finances to improve “a lot” or “some” in the coming year, an increase of 7 percentage points since 2008. By contrast, nine-in-ten Hispanic adults under the age of 30 expect their financial condition to get better, a 13-point rise. The gains in economic optimism are similarly large among Latinos ages 30 to 49 and 50 to 64 (+16 points for each group). Americans with more education fared better during the Great Recession and were the quickest to recover, a trend reflected in the changes in Latinos’ expectations for their family finances. According to the latest survey, those who had completed some college expressed somewhat more confidence in their economic future than those with less than a high school diploma; fully 85% of college-educated Latinos expect improvements in the year ahead compared with 80% of high school graduates and 77% of Latinos with less than a high school education. Moreover, economic optimism has grown roughly twice as fast since 2008 among Latinos who had completed some college (+20 percentage points) than among those with a high school diploma (+9) or less education (+11). Turning to other demographic groups, the latest survey finds that both Latino men (+18 points) and Latina women (+11) are more optimistic about their finances now than they were seven years ago. Among U.S.-born and immigrant Hispanics, hopeful views of their family’s finances rose by 14 percentage points to 81% in each group. How Latinos say they are faring financially today is closely associated with how they predict they will do financially in the coming year, the latest Latino survey found. Overall, Hispanics with a positive view of their current financial situation are significantly more likely than those who rate their economic circumstances as only fair or poor to say their family’s finances will improve over the next 12 months. Among the 40% of Hispanics who say they are in excellent or good shape financially, a third believe that their family’s financial situation will improve a lot in the next year while about half (56%) say they expect some advancement. By contrast, only about 17% of those who say their current finances are in only fair shape and 15% of those who say their finances are in poor shape expect the next year to bring a major improvement in their finances. The optimism Hispanics hold about their personal finances extends to their children’s financial future. About seven-in-ten (72%) Hispanic adults expect their children will be better off financially than they themselves are, while 16% expect their children’s financial situation will be about the same as theirs. At the same time, 75% of immigrant adults and 70% of U.S.-born adults expect their children will be better off. Views also differ by age, with older Latinos more pessimistic about their children’s financial futures than younger Latinos. Among those ages 65 and older, 52% say their children will be better off than themselves. By comparison, 75% of Latinos ages 18 to 29 have similar expectations of their children, as do 76% of those ages 30 to 49 and 70% of those ages 50 to 64. Among those ages 65 and older, 13% say their children will be less well off, higher than among Latinos ages 18 to 29 and 30 to 49. There are differences by educational attainment among Latinos. Among those with at least some college experience, 69% expect their children will be better off financially, with a similar share (71%) of those with less than a high school education saying the same. However, Latino high school graduates are more optimistic than those with some college experience or more, with 79% predicting that their children will be better off financially.